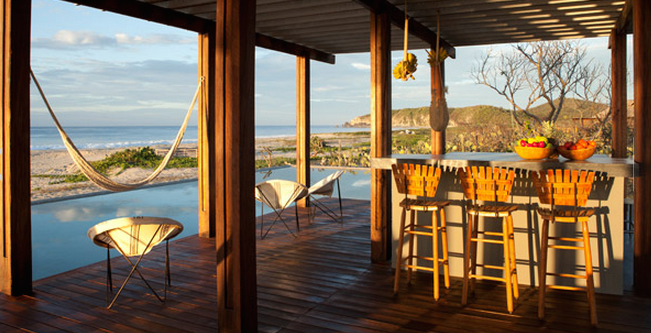 We can't even contemplate summer right now without the tide of our minds lapping up against surf lodges. We dream of them constantly, in all their sand dollar-hued paint, starfish-print decor and sporty glory. If, like us, you're seeking some summertime design inspiration or thinking of planning a surfari in the next year, here are five surf lodges worth cruisin' on into. Deets: Around since 1967 and hanging 10 at the edge of Long Island, The Surf Lodge is a wellness retreat steeped in Montauk's upscale-boho charms. Visit this gem if you appreciate good design, good surf and driftwood towel racks. Deets: Nudged up against MacKenzie Beach, one of Canada's most popular surf spots, the woodsy collection of basic beehive-style cabins at Ocean Village face the ocean for ultimate wave spotting. Bonus: you're so "one" with the water, you can catch a swell before breakfast. Deets: Envisioned by two surf enthusiasts who visited and rode Playa Guiones year-round waves, The Harmony Hotel is an eco-lodge inspired by the tropical destinations of yesteryear for people who appreciate low-key glam and complete escape. Deets: With laid-back palapa bungalows spread across the beach in southern Mexico's surf Mecca, Hotel Escondido brings a dose of style—and a 50-meter infinity pool—to the swell scene. BYO straw hat. Deets: Perched over the Pacific Ocean atop San Diego's most popular surf address, Pacific Beach, cottages lining the pier at Crystal Pier Hotel spell swell with a capital S. It's one thing to surf the break; it's another to sleep over it.